Good grief. I'm quoting Socialism Today and actually agreeing with most of it. The expansion of credit – or the accumulation of debt – prolonged the post-2001 recovery cycle, even amazing the most optimistic capitalists. There has been record global economic growth of around 5% a year for five years. However, this has not led to generalised prosperity, even in the fastest growing economies. On the contrary, inequalities have grown, especially in countries like the US and China, and the huge imbalances between the deficit and surplus countries has become even greater. It is completely unsustainable and will at some point be corrected, quite likely provoking convulsions throughout world capitalism. Every economic crisis is also a political crisis for capitalism. As shown by the Northern Rock episode in Britain, the failure of banks and other financial institutions shakes public confidence, not only in financial institutions but also in the governments responsible for their regulation. In the next few years, the unfolding of economic crises will shatter the idea that capitalism is a ‘successful’ system, the only way of organising the economy and society. This was recognised by Greenspan in his recently published memoirs, The Age of Turbulence. According to the Financial Times (17 September), "He endorses the view that stagnation in average worker incomes in the US poses a threat to the political sustainability of deregulated markets". He also asks: "Why, for all capitalism’s material success, have we not been able to rediscover the 19th century optimism that free markets and free societies will bring a broader measure of human progress". When stagnation gives way to real cuts in workers’ living standards, there will undoubtedly be mass movements against the brutal effects of ‘deregulated markets’, in reality unfettered, ultra-free market capitalism. As in other regions of the world recently, there will be tremendous struggles against the effects of globalisation and neo-liberal policies. The capitalist system will be called into question, shaken to its roots, and there will be an intensified search among the advanced layers of workers for an alternative which, in our view, means a socialist planned economy and workers’ democracy. Capitalism is being tested just like our freedoms are being tested. I'm starting to wonder if either will pass the test. Joke: If this were a dictatorship, it'd be a heck of a lot easier, just so long as I'm the dictator. You will note that the definition of said emergency includes the "economy" word. This story is from New Zealand. The issue of first-home buyers literally being shut out of home ownership has been a hot topic this year. Only last month a home affordability survey found that, in Auckland, almost 100 per cent of a single median-income was required to afford the mortgage on a median-priced house. In Wellington, it was more than 80 per cent. Assuming I'm doing the math right, 100% sure doesn't leave a lot for other things, does it? Allrealestate's general manager Shaun Di Gregorio said rent was becoming the country's new "dirty four-letter word", and there appeared to be a deepening social divide between those who owned homes and those who did not. "As house prices have accelerated, people are starting to feel trapped in the rent world." One key to a happy nation is to keep the currency stable. Just a theory. This post was inspired by a comment left for me anonymously. Partly the fixed-income losses stem from continuing costs associated with writing off bad bets by its in-house hedge fund, Dillon Read Capital Management, in the subprime mortgage market, according to the Journal. But other securities held by the fixed-income division contibuted to the loss too, it said. Sept. 28 (Bloomberg) -- Tate & Lyle Plc, the maker of Splenda sweetener, expects its sugar unit to report a ``small'' loss in the first half, while the decline in the dollar is likely to result in a drop in second-half pretax profit. The projected loss will mean that the company has been in the red for the entire five years since Hitachi acquired it from IBM Corp in 2003, the business daily said, without citing sources. Despite improved margins on substantially higher revenues, the company said its improved cash flow and tax benefits were eclipsed by higher spending on interest, integration and depreciation and amortization. It also took a one-time financing commitment charge of $12.9 million. ``During the third quarter of 2007, there was a significant deterioration in market conditions,'' Mezger said today in a conference call with analysts and investors. Stricter lending standards and an oversupply of unsold homes have hurt new home sales, and ``at this time we are not seeing any indication'' that the market will improve soon. The third-quarter net loss was $513.9 million, or $3.25 a share, exceeding the most pessimistic estimates from analysts and suggesting the worst housing market in 16 years shows no signs of stabilizing. Revenue at Miami-based Lennar fell 44 percent to $2.34 billion, the lowest in more than three years. According to a study done by Rege and Gibson (2003) cited in the report, loss of livestock biodiversity in Africa was due to replacement by other breeds, cross-breeding with exotic breeds or with other indigenous breeds, conflict, loss of habitat, disease, neglect and lack of sustained breeding programmes. Veterinary science experts say some of the major driving forces were economic, social, demographic and political factors. I must apologize. I didn't expect to see a Zimbabwe story turn up when I was searching for "report loss" in Google. Zimbabwe comparisons are completely absurd. They don't have our stable currency nor do they have our strong healthcare system. In any event, here's the musical tribute for those reporting losses! This year China alone will for the first time accomplish the same feat all on its own (at market exchange rates), even if American growth holds up. American consumer spending is roughly four times the size of China's and India's combined, but what matters for global growth is the extra dollars of spending generated each year. But it does not look like getting into trouble over the next couple of years (see article)—the period in which America looks as though it may be feeble. If China can keep flying high, it will help keep the world economy safe. Of course, if America suffers a recession, then Asia's exports will weaken. But this should not hurt GDP growth too much because other factors should help offset the weakening. If emerging Asian economies start to look weak, their governments have some scope to strengthen them. So if exports collapse, governments also have ample scope to boost domestic demand. But emerging Asia accounted for two-thirds of the increase in world energy demand over the past five years. So if Asia remains strong, commodity prices should too, and commodity-producing emerging economies such as Brazil, Russia and the Middle East will also continue to thrive. Emerging Asia cannot pick up all the slack if America goes into recession. But Asia can help to keep the world chugging along. Indeed, a modest slowing in the American economy could even help Asia in the long run if it forces governments to switch the mix of growth from exports to consumption and so make their future growth more sustainable. 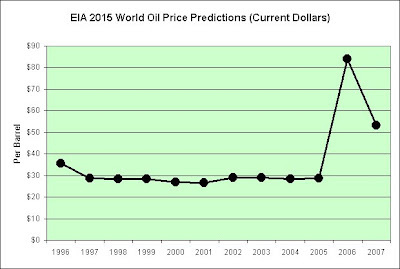 This chart shows the EIA's predictions for the world price of oil in the year 2015 and also shows the years that the predictions were made. The trend line is a 6th order polynomial. Just keep in mind it is virtually worthless for predicting the future. 2005's spike in the trend was Katrina. We have price stability! Wow, just look at it. It is amazing to witness. Well, from 1990 to 2000 anyway. 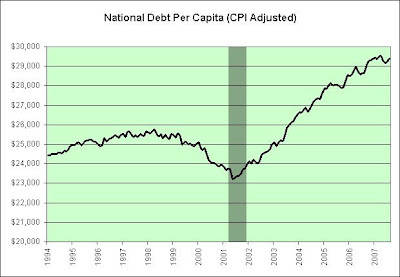 What a nice flat red trend line that almost exactly matches the reported inflation rate. Nice. Very nice. Too bad we're not still living in that prosperous decade. This is the new millennium! So say goodbye to stability, enter volatility! At least we hope so, because the alternative might be hyperinflation. 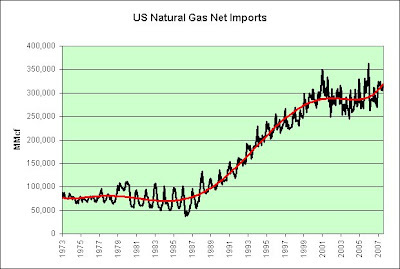 This shows how much natural gas (as measured in millions of cubic feet) we "borrow" from other countries. We're really good at borrowing stuff in the hopes we pay others back in the future. 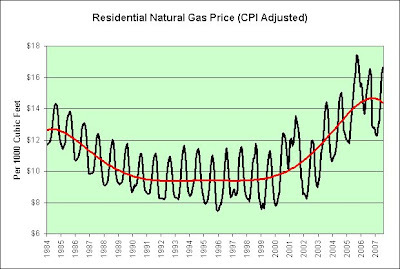 Note that the chart would be even uglier if it was priced in US dollars, since the price of natural gas has been rising (and the dollar has been falling). Schemes? Yeah, me too! I want to be paid in Royal Cubits! Tomorrow the first parcels of KiwiSaver cash pour into fund managers from the IRD, and a survey of the schemes on the market shows investors are opting for the higher end of the risk spectrum. Here is another survey of a scheme. It is always good to start with one drawn up by someone who has been in the business a long time, say an archaeologist. The money heading toward fund managers will be substantial. There's just no arguing with that. Fund managers do need yachts and what not. Savers have had to choose investment managers as well as which funds to invest in, and it appears they have by and large been making good decisions. According to industry sources I take it? Would this group include the fund managers? Are they looking out the front window or are they content with the view out the back window? Industry sources suggest most savers are wisely steering clear of the low risk, low return Kiwisaver default funds. Instead, they prefer higher risk, higher return funds such as balanced funds and growth funds. That is a wise move, as is starting early, because a couple of per cent extra a year makes a big difference in the long haul. It is a wise move that was done wisely. Splendid. It reminds me of the time an executive where I once worked was quoted in the news. He said, and I paraphrase from memory, "It is a fun environment with creativity and fun." I'm fairly sure I have the quote right. It was somewhat etched into my brain since we were experiencing layoffs at the time and the morale was the worst I'd ever seen it. If someone uses the same word on you twice (wisely and/or fun), be afraid, be very afraid, lol. This is not investment advice of course. I'm not a fund manager nor do I play one on the Internet. 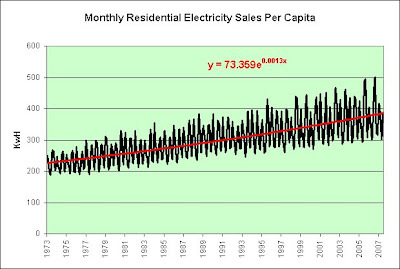 This chart shows the residential electricity sales per month per person. In addition to the electricity needs of a growing population, it is clear that we're also growing our electricity needs individually. This represents roughly a 1.6% average annual increase (0.13% per month). The power delivery system is largely based on technology developed in the 1950s or earlier and installed as much as 50 years ago. The strain on this aging system is beginning to show, particularly as consumers ask it to do things it was not designed to do. In the 1990s, capital expenditures of the US electricity sector were about 12% of total revenues. That life− support level of investment, about half the historic average, was previously approached only during the depths of the Great Depression and World War II, times when private investment was generally very low. Such low levels of investment are dangerous and unacceptable. Moreover, a large share of the investment during the 1990s was in power generation rather than improvements in the power−delivery infrastructure. That period of low investment saw the economic cost of power disturbances, from minor blips to major outages, grow to roughly $100 billion per year in the US, according to an EPRI survey of key industries. In other words, for every dollar spent on electricity, consumers are spending at least 50 cents on other goods and services to cover the costs of power failures. The shaded area represents our last recession. This chart shows how much official government debt we've racked up in the past few years per person and is adjusted for inflation. We often joke of helicopters dropping money to make us spend. I think I still hear them flying. How did you spend your money? Here were just a few of the many options. One box of cereal (on sale for $2.74 a box) for every man, woman, and child in this country, per day. One big screen television ($2,000) for every man, woman, and child in this country, every other year (total of three each). One new car ($24,000) for every four people in this country. If you don't feel like you were given that much money for how much debt you took on, that's okay. I don't think anyone does. Much of the stuff that was purchased was probably just pushed out of a plane in Iraq. 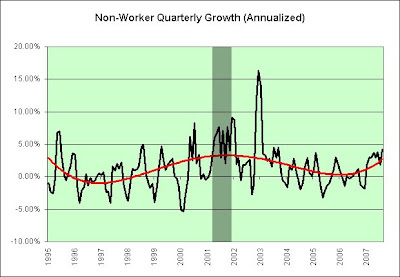 The shaded areas show economic contractions. The red trend line is an exponential curve showing an inflation adjusted 3.5% per year (0.29% per month) growth since 1960. That's some serious growth. The population has been growing by 1% so that's more than likely one third of it. People are moving from using cash to using credit cards. That's certainly a lot of it too perhaps. However, I see very little chance that 3.5% real (inflation adjusted) growth is sustainable in the long-term and is a virtual impossibility in the ultra long-term (for reasons I have described here). The key piece of data in this chart, at least to me, is what happens when credit stops growing (in inflation adjusted terms). It has been quite a long time since that has happened. The last such time was during our last consumer recession (early 1990s). Some would say we'll never have another one of those. The consumer can no longer be tapped out. The consumer is 100% resilient even in the face of $80 oil and a crumpling housing market. I don't mind climbing a wall of worry, but that looks a lot more like a cliff of hope to me. 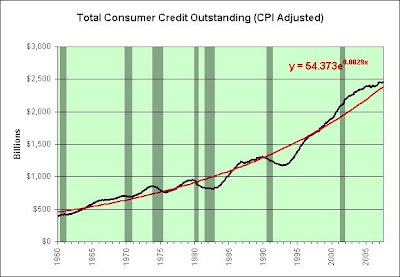 In any event, the consumer clearly is slowing his growth of consumer credit. Should it turn down, we better hope the size of the fall doesn't match the height of the climb. 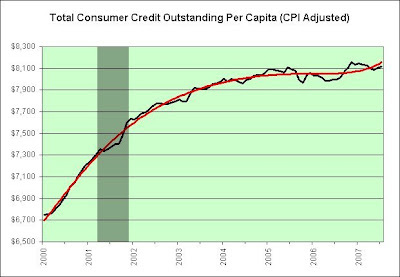 Here's an update showing per capita consumer credit (as requested by an anonymous comment left for me). 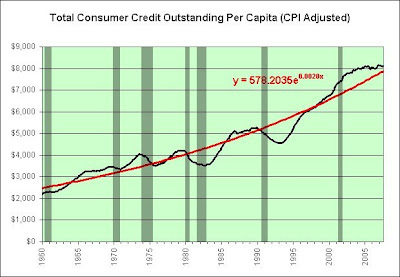 You will note the inflation adjusted per capita growth in consumer credit has averaged about 2.4% per year (0.2% per month). It also makes the chart look that much more ominous (in my opinion). Although it could also be argued that the current trend is our friend (flat-lining). Here's another update showing the curve from 2000 to present (as requested by energyecon). The trend line is a 6th order polynomial. Don't expect much out of it as a prediction tool (Trend Line Disclaimer). However, it might be showing that the curve is not rolling over and is perhaps beginning to trend up again. "The BBC is getting hold of a reasonable amount of video footage that people are taking surreptitiously and sending to them," the foreigner posted Saturday. "Some of it is hand-held video clips shot from the hip (so that the photographer isn't too obvious to the police watching the marches), while other clips seem to have been shot out of windows in tall buildings in downtown Rangoon." This poses a serious problem for governments which rely on secrecy. Wouldn't it be nice if George Orwell had it backwards? Maybe there is hope for the world. 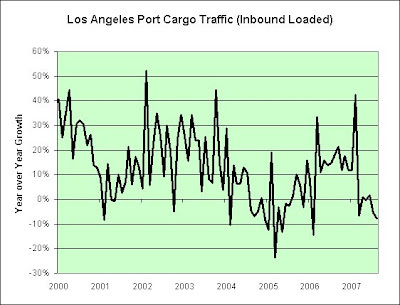 I've updated a previous chart with the data from August, 2007. Inbound traffic appears to be forming a peak. This shows the year over year growth and zooms in a bit. Motorola has had a difficult recent past. Despite rising 2.6% over the past three months, and 3.2% over the past six, it's fallen 26.5% over the past year. Much of the reason has stemmed from a drop in investor confidence after they perceived the company has run in place following the success of its Razr phone, rather than use the momentum of its success to gain a greater slice of the handset market. A difficult recent past? A drop in investor confidence? Has run in place? Momentum of past success? Going after a bigger slice of the market? It seems there are plenty of single family home alligator properties. 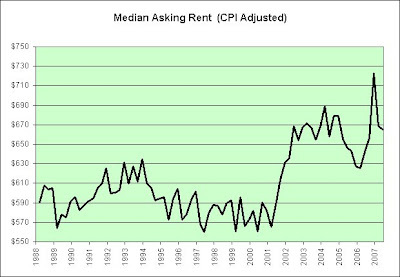 Meanwhile, rent is seemingly higher than the long-term average can support. 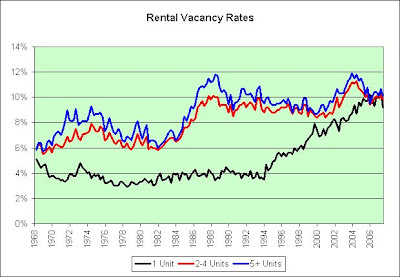 In my opinion, this does not bode well for housing prices. He's in the red, can you believe that? This chart shows the starting point of each economic expansion and its duration. 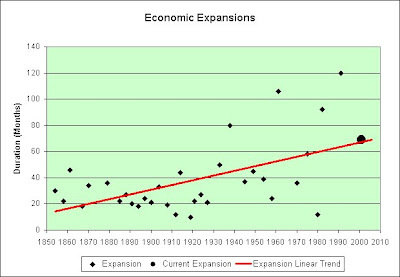 The trend line shows how the duration of economic expansions appears to be growing longer (the current expansion is not included to form the trend line). The current expansion is shown as the black dot. Assuming the slowdown in housing is indicative of a problem, we're pretty much right on schedule for an economic contraction. 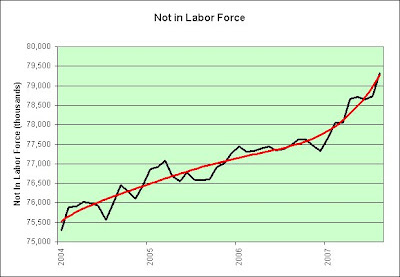 Source Data: National Bureau of Economic Research, Inc. 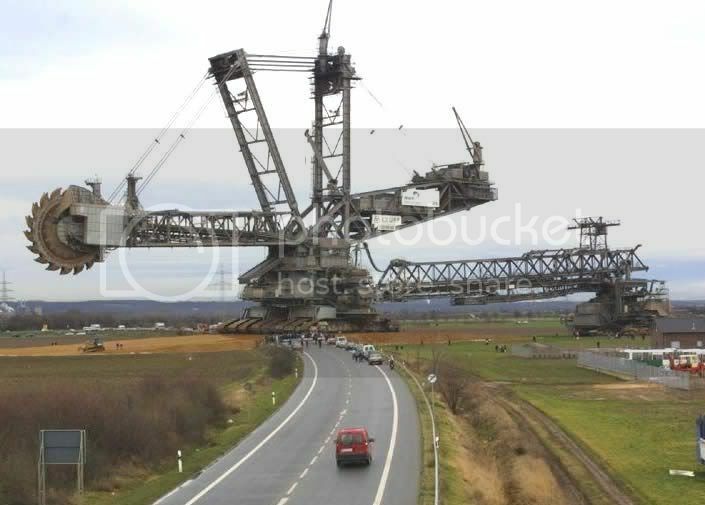 He's got a rear view mirror the size of Texas, that guy! He acknowledges that global economic forces, more than Federal Reserve policy, kept inflation low and manageable for two decades. He fears that could mean a gradual return to persistent 1970s-style inflation over the next 20 years or so. Stagflationary Mark remains stagflationary and has begun to speak of himself in third person in a controlled attempt to contain his growing insanity. He does submit the following '70s-style song to honor The Maestro though. ``We hope that Myanmar will show restraint, remain calm and not take any actions that will complicate the situation,'' Foreign Ministry spokeswoman Jiang Yu told reporters in Beijing. The government there should take steps to ``resolve the crisis,'' he said. At least 50,000 people demonstrated in Yangon today, AFP reported. Amid six hours or protests, security personnel opened fire and the state media reported nine people were killed, according to AFP. Soldiers and police earlier arrested at least 100 people, the news agency said, and two protestors were shot dead yesterday. 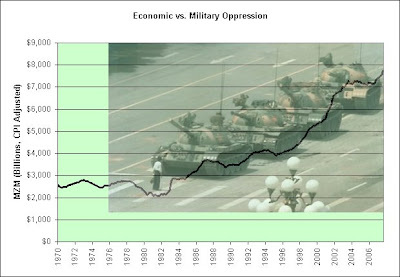 China urging military restraint for civilians seems similar to our Federal Reserve urging monetary restraint for civilians ($83 oil and $740 gold). They sure look like the same picture to me. One is military oppression. The other is economic oppression. I get the sinking suspicion both will get worse before they get better. But hey, what do I know? I have apparently offended a person who loves payday loan centers and I publicly offer this formal apology. Here is the offending article. Here is the comment that was left for me. Let me tell you something alright? Leading up to the time that we had to take out a cash loan, we didn't see anything but negative remarks from others online about the cash loan industry. We ended up almost losing our car because we waited. At the last minute, we borrowed $400 from cashloancity.com and I really believe it is the only thing "at the time" that saved us. I understand that there's a problem with some people abusing this industry and crying about it later, but what about the people that really need it and pay it back on time? We're even getting ready to have a positive mark on our credit because of it. Why are the people that never need this type of loan the same people that keep others from being able to get one? So what do we know about this person cashloancity? Let's read the profile, shall we? I'm co-manager of the website www.cashloancity.com dedicated to finding the best, lowest interest, cash loans available to the public. So, assuming I understand this correctly, cashloancity apparently needed cash fast in order to save cashloancity's car. Cashloancity therefore borrowed $400 from cashloancity.com. I had no idea it had reached this level of pain and suffering in the payday loan center business. Oh the humanity! I was truly touched that cashloancity took the time to write me such a personal and thought provoking comment. It prompted me to see if I could find other people who I might have hurt with my musical tribute. Electric Light Orchestra is one of my favorite bands but apparently it isn't for everyone. That's when I ran across this post. I want you to read the personal and thought provoking comment Roy left. 2. Let me tell you something alright? Leading up to the time that we had to take out a cash loan, we didn't see anything but negative remarks from others online about the cash loan industry. We ended up almost losing our car because we waited. At the last minute, we borrowed $400 from cashloancity.com and I really believe it is the only thing "at the time" that saved us. I understand that there's a problem with some people abusing this industry and crying about it later, but what about the people that really need it and pay it back on time? We're even getting ready to have a positive mark on our credit because of it. Why are the people that never need this type of loan the same people that keep others from being able to get one? Roy is not alone. I also found a personal and thought provoking comment by someone named Ray. Submitted by Ray (not verified) on September 22, 2007 - 2:39am. I therefore offer my most sincere and deepest apologies to cashloancity, Roy, and Ray. This is the inflationary paper. It can work for many years. The more it works the more people start to trust that it will always work. If enough of it exists it can cover almost anything. Our entire system is built on this one simple concept: volume. 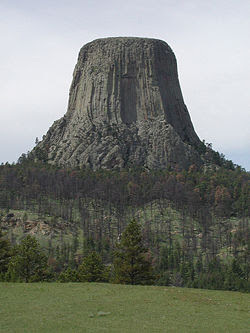 This is the stagflationary rock. Oh how we hate these things! We try to cover them with paper as best we can, but that only works for a little while. Eventually, the paper gets a bit worn out and the rock starts showing through! Evil!! These are the deflationary scissors. Rocks can hurt scissors but the rocks apparently believe that the enemy of their enemy is their friend. There are some rocks which laugh with evil intent as the scissors do their job! Why? Why must they do this!! The main concerns appear to have revolved around three issues: the relentless rise of the euro against the dollar, a rise in oil prices, and financial market turmoil caused by mistrust between banks over investment exposure to America's subprime mortgage troubles. A hoarding of cash by banks will make it increasingly difficult for companies and consumers to borrow money. If the German banks hoard cash, then how are the German people going to come up with the cash needed to hoard canned goods? This is a very complicated situation indeed. They've already had to hoard goods once not all that long ago. I believe it ended with the great bed pan hoarding of Aunt Rosa. The trend lower suggested "a permanent change of course" for the German economy, Commerzbank analyst Ralph Solveen said. "We expect the German economy to lose further steam in the coming quarters," he added. Is that permanent in a Titanic sinking sort of way? I only ask because the Titanic used steam engines. Bonus points awarded to Kevin for reminding me of Germany. Producers of mooncakes have found themselves in a bind. As China's food prices have soared, the cost of raw materials to produce the cakes has increased by 15-30% too. But worried that surging prices could touch off unrest across the country, the government has issued stern edicts warning against price gouging and dictated that the prices of the traditional treat should be kept stable. The Chinese press has reported about resourceful producers in the central city of Zhengzhou who came up with mooncakes made of silver and adorned with 56 precious stones selling at a price of 6,900 yuan (US$920). Not to be outdone, their counterparts in the northern city of Changchun produced a 1,800-yuan mooncakes box containing also a golf club, while mooncake makers in Yunnan province have also managed to pack a digital camera in with the traditional pastries. Here's a view of what one hundred people can do (Japanese style). I'm not so sure it would be funny if a billion people did it though. 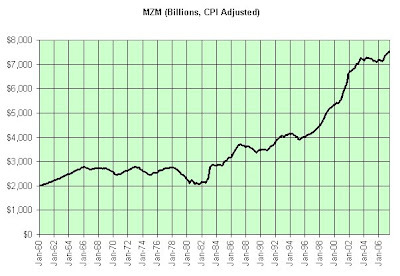 This chart shows the average CPI growth during each economic expansion and contraction. The shaded areas represent recessions (contractions). 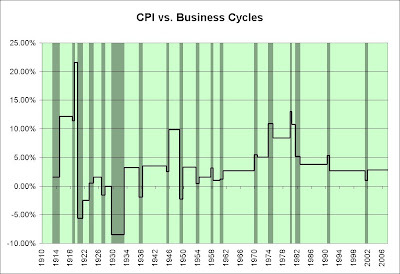 As can be seen in the chart, it isn't always deflationary within a business contraction. The 1970s and our last consumer recession (early 1990s) show it is possible to have an inflationary contraction. Since it is my opinion that we are playing the deflationary forces of a Great Depression off against the inflationary forces of the 1970s, it is very unclear what will happen should we slip into a recession. Ben Bernanke assures us that deflation won't happen here. There's a decent chance he might be right. I see nothing in this chart that makes me want to change my long-term stagflation outlook and continue to believe we are not on a sustainable path. 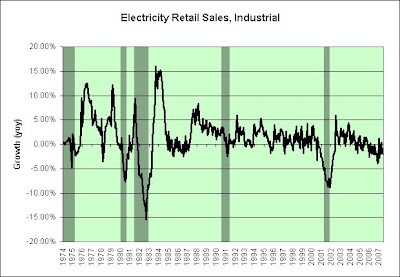 This chart shows the change in electricity retail sales for industrial purposes from one year to the next (as measured in watt-hours). It is current to June, 2007. The shaded areas represent recessions. Our last consumer recession was 1990-1991. "I think everybody is stunned by some of the retail information," said Cummins Catherwood, managing director at Rutherford, Brown & Catherwood in Philadelphia. "There's a caution in the air, but they're not all running and hiding." Sustainability is such a word. It was popularised in 1968 when 12 million copies of the Club of Rome's The Limits to Growth showed that exponential growth was unsustainable. TIPS (treasury inflation protected securities) are paying roughly 2% over reported inflation. Let's say we'll pay 1% of that as taxes, just to make some nice round numbers. We're not being greedy, right? That allows our money (after taxes) to grow at 1% each year (even after reported inflation takes its bite). Since the growth is based on the amount we currently have, it is definitely exponential growth. In theory, it grows at roughly the same rate as our population does (which perhaps isn't a coincidence). And those stupid Romans thought exponential growth was unsustainable. Hahaha! Fools! Well, we're not living in Roman times are we. This is America the Sustainable! As an added bonus, since our TIPS will be growing at roughly the same pace as our population is growing, there are going to be VAST numbers of people to admire what we did with a penny. VAST numbers!!! Actually, I somewhat joke. The number on our account statement will be VASTLY larger, since it will have one million years of inflation driving it higher (since we were invested in inflation protected securities). I should probably mention one thing required when it comes to exponential growth before we break out into a song of sheer ecstasy. For instance, a population in a closed environment cannot continue growing if it eats up all the available food and resources; industry cannot continue pumping carbon from the underground into the atmosphere beyond the limits connected with oil reservoirs and the consequences of climate change; etc. That is a major bummer. It seems not everyone is going to be able to make out like bandits on their pennies nor does it seem likely that the population can continue to grow exponentially forever either. Once again, this is not investment advice. Like Greenspan, I continue to believe that nothing is truly safe when we live in a welfare state. I have somewhat heckled my own investment as you can see, which tells you a lot about how I value the relative safety of its alternatives. Hand basket, meet destination. Maybe not now, maybe not in my lifetime, but certainly within a million years (most likely much sooner). The average borrower took out 7 loans from a single lender last year, a 10 percent increase over last year when the average borrower took out 6.4 loans. Um, for Canada that is. My girlfriend and two of her American coworkers lost their jobs today. She worked at a company based in Canada. Subtract three jobs from America. Add zero to three jobs to Canada. Prosperity baby, that's what I'm talking about. Oh, and by the way, we live up here in the Seattle area. Can't blame this one on the housing market. It's holding up just fine (so far). There's some good news. My girlfriend saw it coming. She already had an interview lined up (for this coming Friday). There's also some bad news. Her coworkers didn't see it coming and thought she was being paranoid. In fact, one just bought a house a few weeks ago. 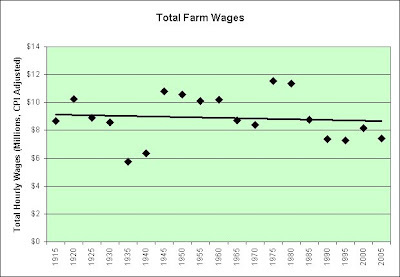 This chart shows the real wage growth of farm workers and the decline in the number of workers (9% every five years). Florida was king when the tower was built in 1956 and until frost, development, diseases, higher US wages and the growth of the industry in Brazil took hold. Florida can’t compete with Brazilian juice on price so it has tried to prevent Brazilian citrus from coming into the US. The trade group representing Florida processors has been busy during the last 20 years to put duties on Brazilian juice. They claim that Brazil dumps its orange juice (sells at less than cost of production) and below fair market value since there is no market in Brazil for it. US juice producers are frustrated by the fact that picking and transporting oranges in Florida costs nearly four times as much as it does in Sao Paulo State. We were once the king of many things. So what, specifically, seems to be the problem with oranges these days? We continue to automate and/or outsource our workforce. How the typical American worker can keep his standard of living is beyond me. Better still, what are billions of workers going to do to fend off automation? Union, automaker due back at the table Tuesday morning as members hit picket lines for second day; impact of strike spreading. Shaded areas represent disco ball decades (hard asset eras). Although oil is $80 a barrel and I fear we might actually run out someday, I'm turning even more deflationary in the short-term. The 1970s ended with a nasty recession. Is this disco ball era getting a bit long in the tooth? Does housing still have any possible room to run to the upside? Are there too many people on the inflation side of the fence? So many questions! In any event, I'm not very bullish on hard assets right now (other than canned goods, lol). Credit isn't money and maybe we have too much of the former and not enough of the latter. This is not investment advice! Do I look like I have all the answers for this mess we're in? That's assuming we are even in a mess of course. The stock market doesn't seem to think so anyway. China has 38 trillion renminbi ($5850 billion) deposited in ordinary bank accounts. The returns on those investments have recently turned negative because inflation has risen faster than the central bank has lifted interest rates. That money has been locked up like a "caged tiger" and is now leaping into the stockmarket. See Money, Money, Money for our version of the caged tiger. Yu likens the stockmarket to a "pyramid financing" scheme in which "immoral acts are tolerated and condoned". Like NINJA ("no income, no job, no assets") loans? He has no idea when the bubble will burst. But when it does, the economic, social and political implications will be large and unpredictable. I'm sure they will "contain" the problems just as well as we are. The "wealth effect" on consumption will reverse. People will lose all their savings. Bad loans from the banking sector will be exposed. And the Government will be judged on whether or not it could have acted to prick the bubble at an early stage or relieved the liquidity pressure by raising the exchange rate. Hey Ben Bernanke, sweating yet? 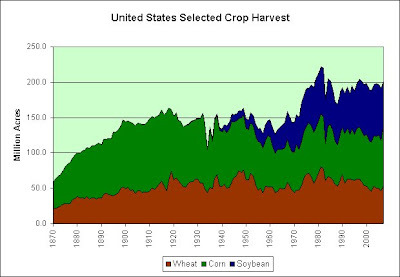 The United States, the world's breadbasket, has undergone two periods of extensive overplowing, each of which led to heavy losses of topsoil. The first occurred in the early 1930s when a severe multiyear drought led to extensive wind erosion in the southern Great Plains. The resulting environmental devastation not only gave the era its name, the Dust Bowl, but it triggered one of the largest internal migrations in U.S. history as droves of people left the southern Great Plains and headed west for California. In the majority of developing countries, the growing demand for food has forced agriculture onto marginal lands. In China, for instance, a doubling of population since 1950 combined with record rises in income since 1980 have nearly tripled the demand for grain. China's loss of cropland to the construction of factories, roads, and expanding cities, particularly in the prosperous coastal provinces, led to mounting concern in Beijing about the country's shrinking cropland area. The result was an attempt to offset these losses by plowing more land in the semiarid northwest. But the newly plowed land, much less productive, was highly vulnerable to wind erosion. As described at the beginning of this chapter, in recent years dust storms in China have become more frequent and more intense, often covering cities in the northeast with layers of dust. In May 2000, the China Daily reported, "Disastrous sand storms that hit several major cities recently in North China have alarmed the nation about the devastating consequences of the development strategy that turned a blind eye on the environment." The desertification now under way in northwest China aroused public concern as "dust-laden blasts began to bury villages, blow into cities, and suffocate residents." These new reports, coupled with scientific studies, indicate that a dust bowl is forming in northern China. The April 2001 dust storm mentioned earlier was one of the largest ever recorded. U.S. scientists in Colorado measured the dust in this storm above them in Boulder at altitudes up to 10,700 meters (35,000 feet). China is losing millions of tons of topsoil, a depletion of its natural capital that it can ill afford. To date, Chinese farmers and herders have transformed about 400,000 square kilometres of cropland and verdant prairie into new deserts. The shepherds have overgrazed the steppes, allowing their sheep and goats to chew the grass all the way down to its roots. The farmers, for their part, have over-exploited the arable land by opening fragile grasslands to cultivation and over-pumping rivers and aquifers in the oases bordering the ancient deserts. The area of desert thus created is equivalent to more than half the farmland in Canada. In terms of conventionally measured growth, China is a miracle. In terms of pollution, however, it is a catastrophe so bad that the latest edition of Foreign Affairs calls it "The Great Leap Backward." Coal-burning power stations spew forth sulfur dioxide and particulates. Acid rain and soil exhaustion are inexorably enlarging the Gobi Desert. Dust storms and brown smog clouds are becoming commonplace. So are pollution-related cancers. This post inspired by kwark's topsoil comment. But do inflation and imbalances lie in wait? Oh man, I really thought I had a reason to be optimistic there for a minute. When Fonterra announced last month its forecast payout of $6.40 a kilogram of milksolids, normally sober economists struggled for adjectives to describe the economic impact. Sober economists are hard to find these days. Possibly the biggest positive shock to the economy, said one. 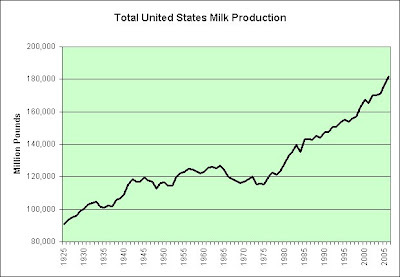 The good news, for primary producers at least, is that it is not just a dairy boom. International grain prices have also ascended into the stratosphere and, though New Zealand is not a grain exporter, the price rises are expected to push up the price of meat. "We've been looking for this fundamental repricing of agricultural commodities since the early 1970s," he says. I've already got my disco balls. "There's always been a feeling that as population grew in developing countries somebody would have to feed them and we knew at some point there would be a bit of a crunch between supply and demand with food." Credit Crunch meets Captain Crunch! Epic battle! Stay tuned! "It's the very real consequence of the global pick-up in food price inflation, termed agflation," it said. Just two more letters on the front of that agflation and my job will be complete. The last major spike in world food prices was in the early 1970s. Oh yeah, that's what I wish I wasn't talking about. Oh no, baby. This chart shows the amount of acres harvested for some of our largest field crops. As you can see, they just aren't making much more land these days. The values are stacked one on top of another. 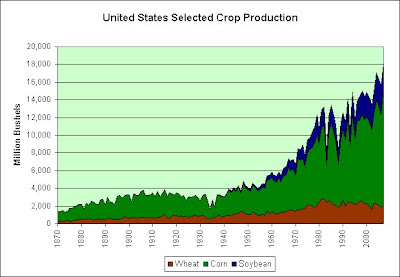 In other words, in 2007, each of these crops took up about the same amount of farmland. Can you see the pressure being put on wheat? This is the amount of production in millions of bushels. The productivity miracle has been working overtime on corn. Too bad we intend to power our vehicles with it (ethanol) instead of eat it. Wheat on the other hand, isn't doing all that well. Behold the productivity miracle. 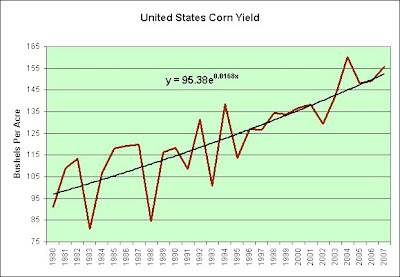 Keep in mind corn has always been far more efficient at pumping out bushels. Corn wouldn't stand out so much if I normalized them looking solely at the growth. 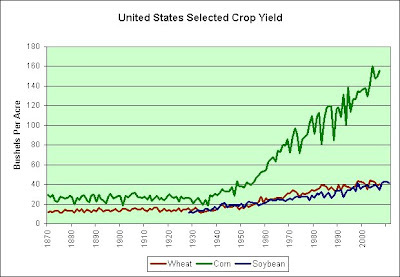 The thing to take from the chart is that we've had a substantial improvement in crop yields starting in the 1930s. It truly has been a productivity miracle. The big question is whether we can keep it up or not. The biggest question might be what happens if we truly do run out of cheap oil. As impressive as it is to increase bushels per acre, it still assumes we have the energy to do it (cost effectively). 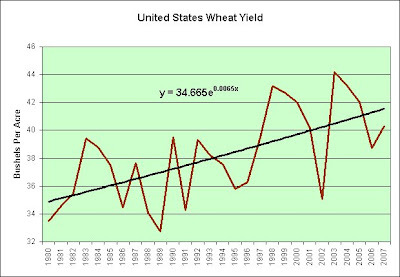 Wheat's productivity miracle is starting to sputter. 0.65% growth does not keep up with US population growth. Should that trend continue, we'll need to find more land. It also might help explain why wheat is trading at record highs right now (in addition to other possible reasons: speculation, high oil prices, trade deficit inspiring billions to buy food). 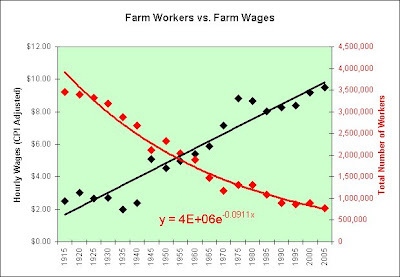 If they continue to improve corn at the present rate (1.7% annual growth in yield), it will become a sentient being within a few decades and form its own trade union. 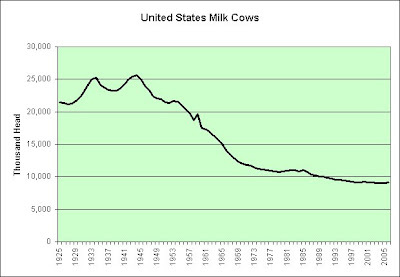 Unfortunately, we'll probably still be burning it as fuel (based on how we treat our milk cows). 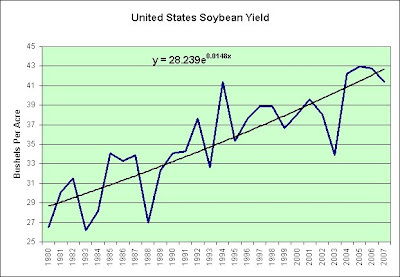 Soybeans keep chugging along (1.5% annual growth in yield), although there is a hint in recent years that might be changing. The CSFII results indicate that low-income consumers ate 72 pounds of beef yearly—more than did middle- and high-income consumers by at least 4 pounds (table 2). This surprised me a bit. I find beef rather expensive compared to some alternatives (i.e. cheap processed food). It is far more efficient to eat what the cow eats. 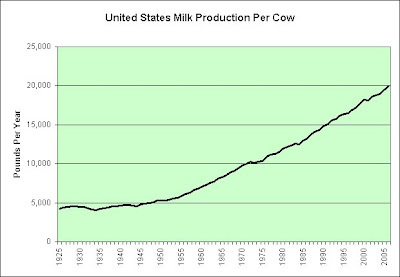 In any event, our population is growing and I don't see the cattle population growing with it. 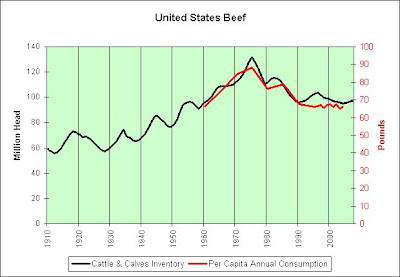 I'm not holding my breath waiting for beef to get any cheaper. Bruce Longo, analyst with Urner Barry's Yellow Sheet, said grocers have featured more of the cheaper chuck and round cuts throughout the summer due to tightened food budgets and concerns about the economy with home foreclosures on the increase. High fuel prices also are a factor. Shoppers have traded down to cheaper items to stretch their food budgets, he said. The additional features and sales have helped prop up wholesale chuck prices. Well, that's quite the prosperity story. So much for containment. Start with what looks like bad news. End up with good news. If I'm wrong to be a stagflationist, this is the sort of thing that would do me in. It is also something one needs to factor in when hoarding hard assets in general. I find it all quite humbling. Don't you? This is an update of a previous chart showing the change in price of unleaded regular gasoline from one year to the next. The shaded areas represent recessions. 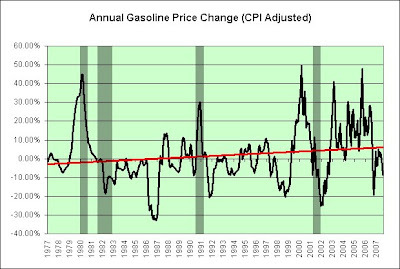 It uses monthly data instead of annual data, uses the CPI-U to adjust the nominal price to current dollars (vs. 2000 chained dollars), and the data is current to August, 2007. "It's fasten your seat belt it's going to be a bumpy ride time," said James Lott, executive vice president of the Hospital Assn. of Southern California, a trade association. First the bad news. Engine #1 is failing. The left wing is cracking. We're hopelessly lost and low on fuel. There's a mountain goat up here in the clouds (Far Side reference) and we're currently in a semi-controlled dive. Now for the good news. We're still making good time and should be on the ground well ahead of schedule. China has more than tripled automobile output and sales since joining the World Trade Organization in 2001. Last year, it surpassed Germany as the world's third-largest vehicle maker. The nation has designated eight port cities, including Shanghai, Tianjin and Xiamen, to serve as the country's main automobile and component export centers. SHANGHAI - September 14, 2007: General Motors (China) president and CEO, Kevin Wale, said he was confident the company could sell one million cars in China this year. The price cuts, by both domestic and international auto makers, are pinching industry profits, said John Bonnell of market researcher J.D. Power & Associates' Automotive Resources Asia unit in Bangkok. He said things will get worse before they get better. "People aren't willing to give up. As long as they have the resources to stay in the game, they will keep cutting," predicts Mr. Bonnell. "But it's not leading to a healthy industry." All the time our customers ask us, "How do you make money doing this?" The answer is simple, "Volume." 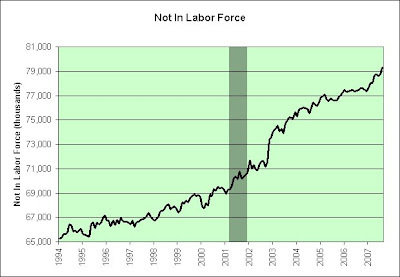 This is a chart of the growth in those not working (those not in labor force plus those unemployed). It uses the change over the previous three months and then annualizes that change to show the annual rate. The shaded area represents our last recession. 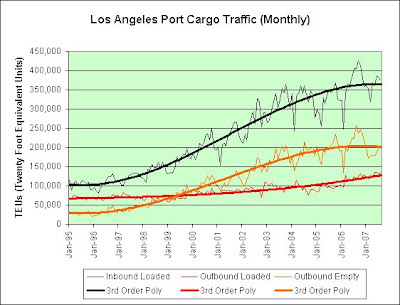 The trend line is a 4th order polynomial. Once again, if accurately predicting the future using past data was this trivial, I would certainly find more profitable ways to spend my time than filling blogspace with my thoughts, lol. This is a closeup of a previous chart. The red trend line is a 6th order polynomial. It looks just like the 5th order polynomial, and the 4th order polynomial, and yes, even the 3rd order polynomial. Four out of four higher order polynomials agree (seriously)! Just keep in mind that trend lines can be dumb as bricks. Just ask them to find the USA on a world map and you'll see. 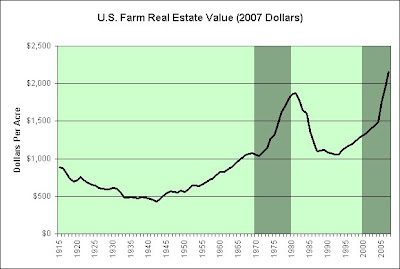 Further, extrapolating trend lines into the future can be very dangerous for investors (dotcom bubble, housing bubble). Right? However, this does beg the question, "Why am I sitting in this Made in China hand basket and where are we headed?" Or perhaps it simply means we feel so much more prosperous now (with oil up at $80 a barrel) that we don't need to work any longer. 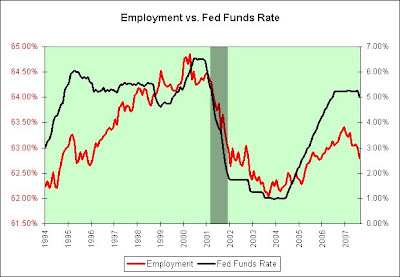 This chart shows the employment-population ratio and also shows the Fed Funds Rate. I'm using the theory that it doesn't matter why people aren't working. All that matters is that they aren't. If you think this theory has merit, then this was an extremely weak recovery. It also explains why Bernanke may have done the right thing by lowering interest rates. Further, he might have been way too late. What could he do though? The price of oil kept going up. This chart makes me slightly more deflationist in the short-term (and for those keeping score at home, I was already a bit deflationist in the short-term). I'm still stagflationist for the long-term though. It seems we could tolerate a high Fed Funds rate in the mid 1990s. I guess we're just far too leveraged these days. Oh well! At least that's how I'm calculating it and it seems to match the BLS's version. Special thanks to Kevin for inspiring me to dig through the BLS data. The pendulum now is beginning to swing the other way. We estimate that costs involved in the insurance areas in which we operate rise at close to 1% per month. This is due to continuous monetary inflation affecting the cost of repairing humans and property, as well as “social inflation”, a broadening definition by society and juries of what is covered by insurance policies. Unless rates rise at a comparable 1% per month, underwriting profits must shrink. Recently the pace of rate increases has slowed dramatically, and it is our expectation that underwriting margins generally will be declining by the second half of the year. But before we drown in a sea of self-congratulation, a further - and crucial - observation must be made. A few years ago, a business whose per-share net worth compounded at 20% annually would have guaranteed its owners a highly successful real investment return. Now such an outcome seems less certain. For the inflation rate, coupled with individual tax rates, will be the ultimate determinant as to whether our internal operating performance produces successful investment results - i.e., a reasonable gain in purchasing power from funds committed - for you as shareholders. Just as the original 3% savings bond, a 5% passbook savings account or an 8% U.S. Treasury Note have, in turn, been transformed by inflation into financial instruments that chew up, rather than enhance, purchasing power over their investment lives, a business earning 20% on capital can produce a negative real return for its owners under inflationary conditions not much more severe than presently prevail. If we should continue to achieve a 20% compounded gain - not an easy or certain result by any means - and this gain is translated into a corresponding increase in the market value of Berkshire Hathaway stock as it has been over the last fifteen years, your after-tax purchasing power gain is likely to be very close to zero at a 14% inflation rate. Most of the remaining six percentage points will go for income tax any time you wish to convert your twenty percentage points of nominal annual gain into cash. That combination - the inflation rate plus the percentage of capital that must be paid by the owner to transfer into his own pocket the annual earnings achieved by the business (i.e., ordinary income tax on dividends and capital gains tax on retained earnings) - can be thought of as an “investor’s misery index”. When this index exceeds the rate of return earned on equity by the business, the investor’s purchasing power (real capital) shrinks even though he consumes nothing at all. We have no corporate solution to this problem; high inflation rates will not help us earn higher rates of return on equity. One friendly but sharp-eyed commentator on Berkshire has pointed out that our book value at the end of 1964 would have bought about one-half ounce of gold and, fifteen years later, after we have plowed back all earnings along with much blood, sweat and tears, the book value produced will buy about the same half ounce. A similar comparison could be drawn with Middle Eastern oil. The rub has been that government has been exceptionally able in printing money and creating promises, but is unable to print gold or create oil. We intend to continue to do as well as we can in managing the internal affairs of the business. But you should understand that external conditions affecting the stability of currency may very well be the most important factor in determining whether there are any real rewards from your investment in Berkshire Hathaway. For the last few years our insurance companies have not been a net purchaser of any straight long-term bonds (those without conversion rights or other attributes offering profit possibilities). There have been some purchases in the straight bond area, of course, but they have been offset by sales or maturities. Even prior to this period, we never would buy thirty or forty-year bonds; instead we tried to concentrate in the straight bond area on shorter issues with sinking funds and on issues that seemed relatively undervalued because of bond market inefficiencies. And, of course, there is the possibility that our present analysis is much too negative. The chances for very low rates of inflation are not nil. Inflation is man-made; perhaps it can be man-mastered. 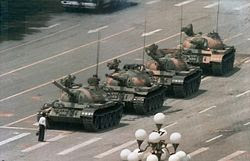 The threat which alarms us may also alarm legislators and other powerful groups, prompting some appropriate response. High rates of inflation create a tax on capital that makes much corporate investment unwise - at least if measured by the criterion of a positive real investment return to owners. This “hurdle rate” the return on equity that must be achieved by a corporation in order to produce any real return for its individual owners - has increased dramatically in recent years. The average tax-paying investor is now running up a down escalator whose pace has accelerated to the point where his upward progress is nil. For example, in a world of 12% inflation a business earning 20% on equity (which very few manage consistently to do) and distributing it all to individuals in the 50% bracket is chewing up their real capital, not enhancing it. (Half of the 20% will go for income tax; the remaining 10% leaves the owners of the business with only 98% of the purchasing power they possessed at the start of the year - even though they have not spent a penny of their “earnings”). The investors in this bracket would actually be better off with a combination of stable prices and corporate earnings on equity capital of only a few per cent. Of course, the two forms of taxation co-exist and interact since explicit taxes are levied on nominal, not real, income. Thus you pay income taxes on what would be deficits if returns to stockholders were measured in constant dollars. At present inflation rates, we believe individual owners in medium or high tax brackets (as distinguished from tax-free entities such as pension funds, eleemosynary institutions, etc.) should expect no real long-term return from the average American corporation, even though these individuals reinvest the entire after-tax proceeds from all dividends they receive. The average return on equity of corporations is fully offset by the combination of the implicit tax on capital levied by inflation and the explicit taxes levied both on dividends and gains in value produced by retained earnings. As we said last year, Berkshire has no corporate solution to the problem. (We’ll say it again next year, too.) Inflation does not improve our return on equity. Our acquisition preferences run toward businesses that generate cash, not those that consume it. As inflation intensifies, more and more companies find that they must spend all funds they generate internally just to maintain their existing physical volume of business. There is a certain mirage-like quality to such operations. However attractive the earnings numbers, we remain leery of businesses that never seem able to convert such pretty numbers into no-strings-attached cash. In past reports we have explained how inflation has caused our apparently satisfactory long-term corporate performance to be illusory as a measure of true investment results for our owners. We applaud the efforts of Federal Reserve Chairman Volcker and note the currently more moderate increases in various price indices. Nevertheless, our views regarding long-term inflationary trends are as negative as ever. Like virginity, a stable price level seems capable of maintenance, but not of restoration. Despite the overriding importance of inflation in the investment equation, we will not punish you further with another full recital of our views; inflation itself will be punishment enough. (Copies of previous discussions are available for masochists.) But, because of the unrelenting destruction of currency values, our corporate efforts will continue to do a much better job of filling your wallet than of filling your stomach. Most American businesses pay out a significant portion of their earnings and thus fall between the two examples. And most American businesses are currently “bad” businesses economically - producing less for their individual investors after-tax than the tax-exempt passive rate of return on money. Of course, some high-return businesses still remain attractive, even under present conditions. But American equity capital, in aggregate, produces no value-added for individual investors. Inflationary experience and expectations will be major (but not the only) factors affecting the height of the crossbar in future years. If the causes of long-term inflation can be tempered, passive returns are likely to fall and the intrinsic position of American equity capital should significantly improve. Many businesses that now must be classified as economically “bad” would be restored to the “good” category under such circumstances. A further, particularly ironic, punishment is inflicted by an inflationary environment upon the owners of the “bad” business. To continue operating in its present mode, such a low-return business usually must retain much of its earnings - no matter what penalty such a policy produces for shareholders. But inflation takes us through the looking glass into the upside-down world of Alice in Wonderland. When prices continuously rise, the “bad” business must retain every nickel that it can. Not because it is attractive as a repository for equity capital, but precisely because it is so unattractive, the low-return business must follow a high retention policy. If it wishes to continue operating in the future as it has in the past - and most entities, including businesses, do - it simply has no choice. If inflation is rising in China and inflation hurts low-return businesses the hardest, then what does that say about how well China can weather an inflationary storm?